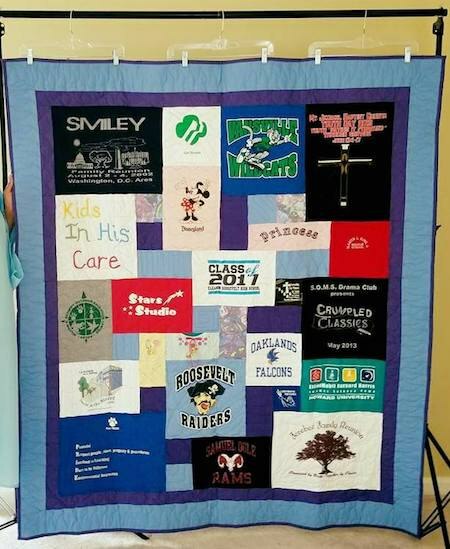 When hanging a quilt for a short period of time, say for a party or to photograph it, you want a quick method that does not harm the quilt or the structure on which it is hung. 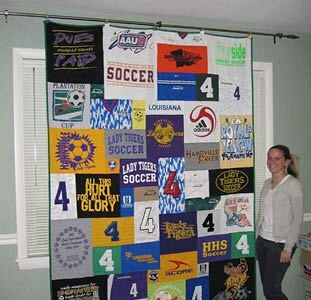 Below are some photos of some possible ways to hang your quilt. As we get more examples we will post them here. Pant hangers with the hooks that swivel will give you more hanging flexibility. You can hang the hangers from a bar stretched between two ladders, from gutters, from a rope tied between two trees or any other way you can come up with using what you have around you. 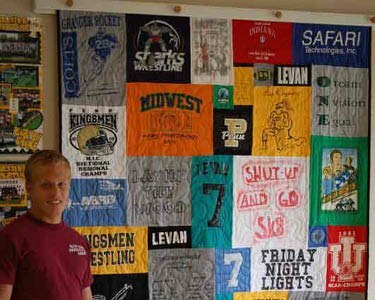 This quilt was hung to a curtain rod using steel spring office clips. Another office supply that can be used to hang your quilt is push pins. Push the pin into the quilt right at the binding and put the pin into a wall or the top of window or door moldings. This quilt was hung to a curtain rod using steal spring office clips. Another office supply that can be used to hang your quilt is push pins. Push the pin into the quilt right at the binding and put the pin into a wall or the top of window or door moldings. 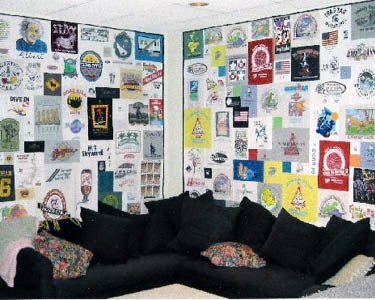 Considerations for permanent display of your quilt include a wall area large enough to put your quilt. Another consideration is the damage your hanging system may do to your wall. And remember that sunlight fades fabric at a rate faster than you might realize. So watch where you hang your quilt. There are any number of commercial quilt hanging systems. Just Google “how to hang a quilt” or “quilt hangers” and you will get more systems than you might realize. We use this IKEA system (photos to the left) for hanging our quilts here in the shop. The quilt just clips on to the hangers that hang on the wire that is strung from anchor point to anchor point. With this system we can change our quilts as frequently as we would like. This system does not require a special sleeve or loops to be sewn onto your quilt. And as a bonus, the quilt can be moved along the wire like a curtain. A curtain rod in a sleeve on the back of the quilt. 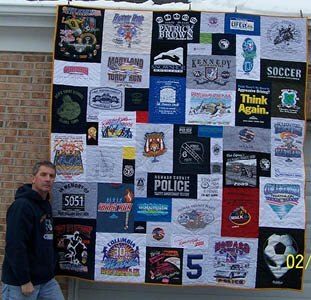 This is a traditional way to hang a quilt. 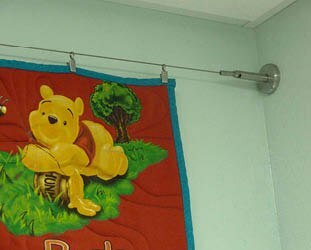 Any type of curtain rod and holders can be used. It does require a sleeve on the back of the quilt or hanging loops.